Some time ago I visited Mount Vernon with my mother and my kids. 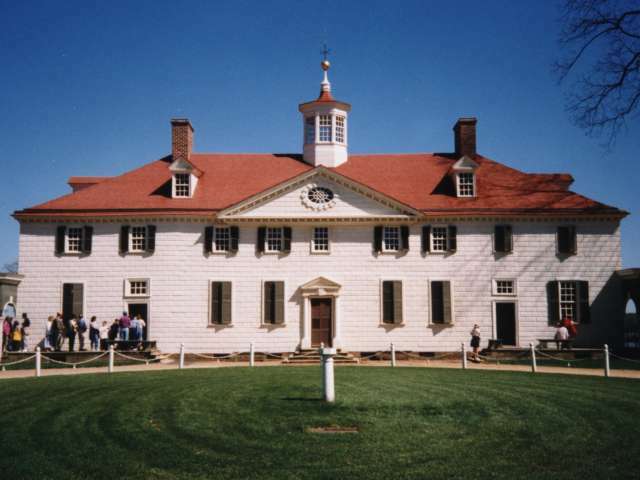 Mount Vernon is where George Washington lived with his wife Martha (some of you may already know this). It wasn't our first visit to the estate, so this time I was able to notice some things I hadn't seen the first time around. In particular, I noticed elements of 18th century technology. Very often in fiction I think we encounter technologies from our era, from some imagined future, or from ancient times - either medieval or even earlier, back to bronze age. But there are so many more opportunities out there for worldbuilding! This was a great visit for me because I really enjoyed seeing how George Washington and the people at Mount Vernon were innovating technologically. Here were some of the cool technologies we saw - I hope you find them similarly inspiring. The most obvious piece of technology is the cupola on the roof of the house, which is very evident in pictures. You might not imagine this to be technology, but in fact it is (even independently of the architecture and the craftsmanship required to make it). The cupola was actually designed to concentrate rising hot air in the house, and so on hot days the family would open its windows in order to cool the house off. Another architectural technology we saw was the sixteen-sided barn that George Washington designed, a replica of which now stands in the Mount Vernon farm. It has sixteen sides, making it roughly circular, and two stories. This illustration shows how it worked. Between the upper and lower floors was a layer of narrow but sturdy planks with gaps in between. 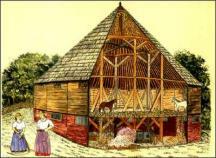 Workers would lay out wheat on that floor, and then horses would be brought in to trot in a circle, which would break the wheat grains free of the straw. The grains would then fall through into the lower area, and be swept up, winnowed, and taken to the mill to be ground into flour. We actually had quite a laugh because the fellow there explained to us how important it was to keep the horses trotting constantly without letting them stretch. If they stretched, they would be likely to urinate and ruin the wheat below. In any case, there is an earthen hill built up on one side so the horses can walk directly in to the second floor, and a separate entrance to the first floor on the opposite side. It's as close as you can get to automating this part of the process without actually using machines. Inside the house were a couple of other marvels. One was a chair that had a board suspended above it. This board was connected to foot pedals below the chair, so that you could sit in the chair, push the pedals with your feet, and the board above you would wave back and forth and fan you on a hot day. We actually had lovely weather the day we were there, but I've been there when it's been hot enough that I would have enjoyed that chair myself! Last, and possibly most impressive, was an innovative design in the kitchen. We walked in and I immediately noticed that there was a rack before the fire where spits were set - the spits were instantly recognizable, since they were long iron rods sharpened at one end and with a turning-handle on the other. But there was also a very interesting pulley apparatus there. A gear at one end of a spit had a chain that extended up into the invisible recesses of the chimney. I asked the volunteer docent to explain this, and was amazed: the other end was another gear attached to a metal fan. The idea was that the rising smoke and hot air would cause this convection fan to turn, and that would turn the gears, and thereby turn the spit. That meant that nobody had to stand there and constantly turn the spit; so long as the fire was going, the rising hot air would cause the spit to turn on its own. Get creative with your worldbuilding. Remember that technological development is a long process with lots of twists and turns, and that it doesn't necessarily jump from one "age" or "level" to another. You can even forbid yourself to use certain types of technologies and see how that might change the other technological developments around them. What if these people didn't have the wheel? What if they had never discovered the steam engine? Challenge your mind and see what clever solutions you can come up with for local problems like heat or food production. Wow, those are some neat points. I haven't been out there since I was on my 8th grade class trip, not the best time or age to notice cool things like that. The self-turning spit is awesome. It's slanted towards fantasy writers and gamers, but it has some good stuff. Thanks, Jaleh! It was certainly fun to go there and notice new things. Thanks for the link, too! Those Founding Fathers...they were truly worldbuilding geniuses! I have seen that site before, but thanks for reminding me Jareh. Apparently I hadn't bookmarked it the first time.